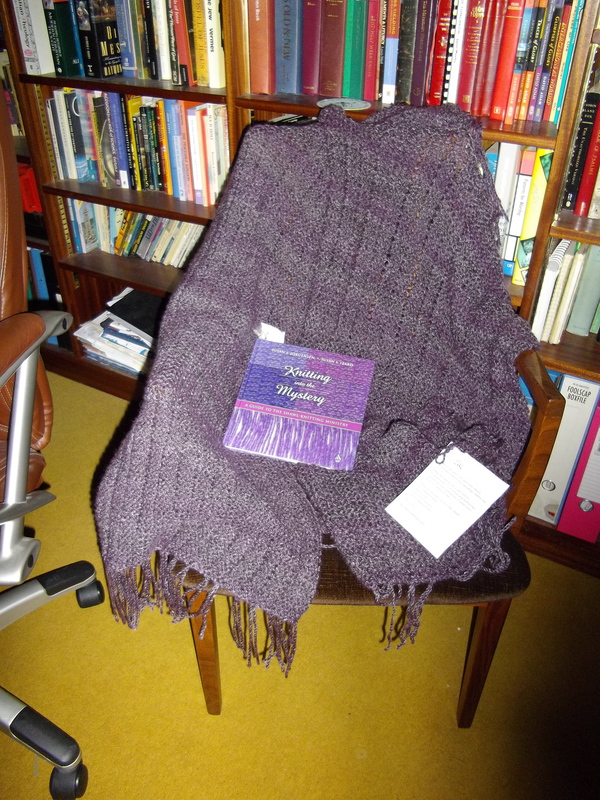 Soon after I was diagnosed with cancer, my American namesake sent me a shawl, knitted in lovely soft wool. It came with a prayer attached; “May the peace which passes all understanding surround you. May the healing power of God be with you. On this date …. and around our gathered circle, this shawl has passed through our praying hands and been blessed by our loving hearts”. Church of the Master Knitting Circle. There was also a book ‘Knitting into the Mystery’ by Susan J Jorgensen and Susan S Izard, which explained the prayer shawl ministry and gave instructions and stories about the way knitting could be combined with prayer to provide a ministry of comfort and affirmation. I’ve returned to knitting recently, since I’ve had grandchildren and since we no longer have cats (who would play with the wool and prevent progress). Over Christmas, I completed two prayer ministry shawls and today I gave one away for the first time, to an old friend, who I first knew at teacher training college, and who later became a Reader (Licensed Lay Minister) like me. She has been ill recently, and has had to give up her home and go into residential care. The second will be given away on Sunday, to a member of the parish recently diagnosed with cancer. This entry was posted in Books, Church, Knitting, Ministry and tagged knitting, ministry, prayer, Reader, shawl. Bookmark the permalink. My knitting skills are very much of the knit one, purl one variety, but yours looks beautiful – and one must feel very cherished to receive such a present. I am so pleased you are blogging! The prayer shawl pattern is very simple – knit 3, purl 3, so it doesn’t require great skill. The idea is that you pray for the person you are making it for as you knit – it can become a sort of exercise in prayerful meditation. You just have to cast on any multiple of 3 to get the pattern right. And because you use thick (chunky weight wool) and big needles, they don’t take very long. A second prayer shawl was given away today – to someone who is about to start treatment for cancer of the pancreas. I have begun knitting another. The third prayer shawl will be finished this evening. It will be sent to a friend undergoing treatment for cancer. Latest prayer shawl finished. Just need to add prayers and leaflet before it gets posted off.